Vertical Designer Radiators Oval Columns. 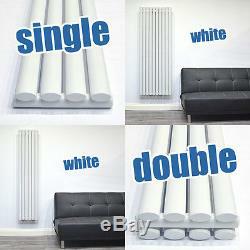 These vertical designer radiators are an excellent and affordable way to add both warmth and style to your home. The radiators are manufactured to the highest possible standards using premium quality mild steel which ensures reliability and provides an impressive heat output. No expense has been spared in the manufacturing process of these designer radiators, they have a professional finish in a variety of colours worthy of any retail showroom and the high quality components used inside provide an excellent output of heat. Our radiators have just as much emphasis on performance as they do appearance; therefore, you can be assured that our radiators will keep your home warm throughout the coldest winter months. This particular radiator has vertical oval tubes which create a beautiful contemporary appearance in your home, we have them available in a variety of popular sizes as well as single sided and double sided options to cater for any size of room / area. As with all products used in households and workplaces, we believe safety is paramount. Unlike some cheaper alternatives, our radiators are tested and certified to BS EN 442 Standards and all safety marks are affixed to every radiator we supply. Dimensions (H x W), Panel. 1600mm x 236mm - Single. 1600mm x 354mm - Single. 1600mm x 472mm - Single. 1600mm x 590mm - Single. 1600mm x 236mm - Double. 1600mm x 354mm - Double. 1600mm x 472mm - Double. 1600mm x 590mm - Double. 1780mm x 236mm - Single. 1780mm x 354mm - Single. 1780mm x 472mm - Single. 1780mm x 590mm - Single. 1780mm x 236mm - Double. 1780mm x 354mm - Double. 1780mm x 472mm - Double. 1780mm x 590mm - Double. Please note that pipe centre measurements are only approximate and can differ depending on the valves used and installation process. We strongly advise that you don't install any pipework before you receive your radiator. All radiators are made from Mild Steel, have a 15mm / ½ Inlet and come with a 10 Year guarantee. All our radiators are built with quality in mind to ensure they stand the test of time and dont let you down. We can assure any potential customers that our products are manufactured from the highest quality materials and will fulfil their expected lifeline regardless of the environment they are used in. Furthermore, and perhaps more importantly; all our products have been thoroughly inspected in European based test labs to ensure they meet all the required safety standards. We believe safety is paramount when installing appliances in your homes and our excessive testing regime guarantees you will receive a perfectly safe product. We supply our products to companies of all sizes throughout the UK and have done so for a number of years, if you require some affordable radiators with no substitute for quality then our radiators would be an excellent choice! Please get in touch if you require any further information on our products. If for any reason you wish to return your item, please return to the below address. In the unlikely event your item arrives damaged / incorrect / faulty, etc. We have offices in Yorkshire and Lancashire, however; if you wish to visit us for whatever reason then you would need to go to our Lancashire offices below. We have our radiators on display so it may be beneficial to visit us if you are unsure of what you require and need advice. All UK mainland orders are delivered free of charge on next day service with DPD. AB37, KW1 - KW14, PA34 - PA40, PH19 - PH50, TH41, IV1-IV63. ZE1 - ZE3, KW1, KW15 - KW17, HS1 - HS9, PA20, PA41 - PA80. JE1 - JE4, GY1 - GY10. The item "White Vertical Designer Radiators Tall Oval Modern Column Panel Central Heating" is in sale since Friday, May 27, 2016. This item is in the category "Home, Furniture & DIY\Bath\Towel Rails". The seller is "home_improvement_store" and is located in Leeds, West Yorkshire. This item can be shipped to United Kingdom.